Size: 4ft 7in x 4ft 3in (140 x 130cm). 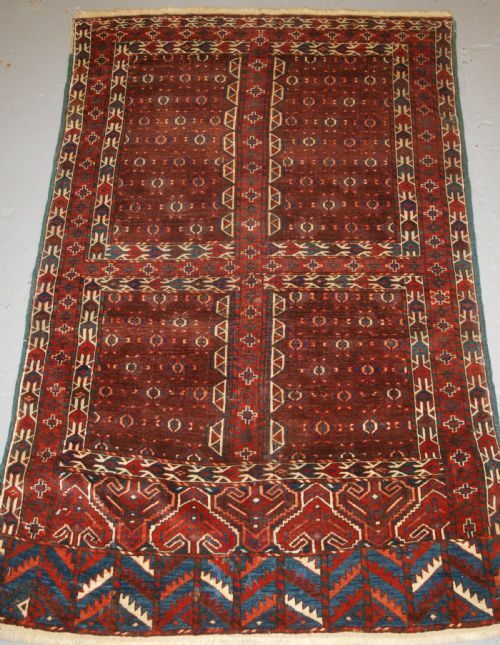 Antique Tekke Turkmen Ensi of classic design with good colour. Ensi are considered to be traditional ceremonial door hangings for the entrance to the tribal yurt. The make excellent small square floor rugs. Good condition with very slight wear and good pile. Size: 4ft 11in x 3ft 5in (150 x 104cm). 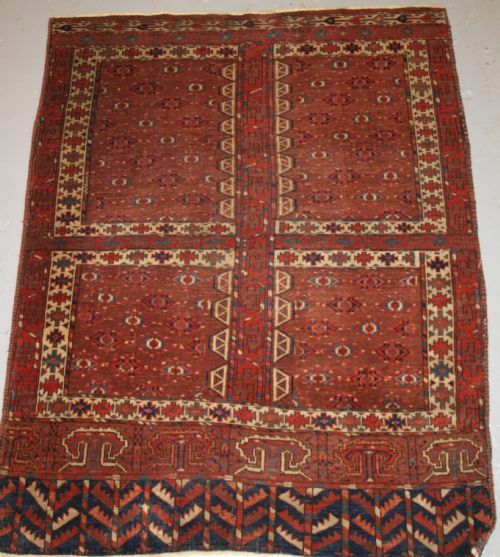 Antique Tekke Turkmen Ensi of very early form. 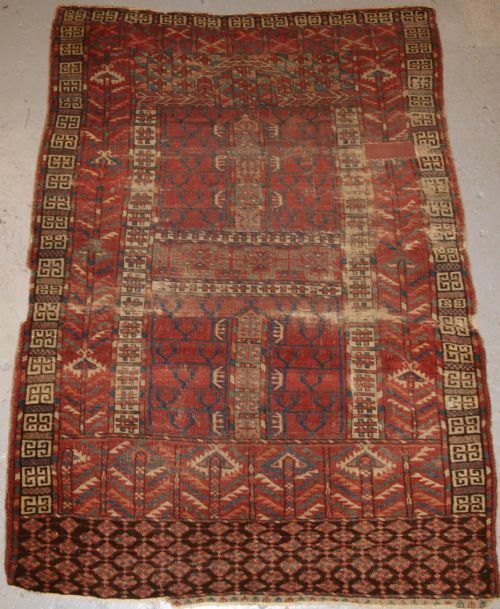 Early Tekke ensi are quite scarce and this example despite its condition is complete. The colours are excellent and combined with the quality of the drawing and the weave we can give this example an early date. The ensi has been conserved by patching from the back any holes or weak areas. Hand washed and ready for display. Size: 5ft 7in x 4ft 9in (170 x 146cm). 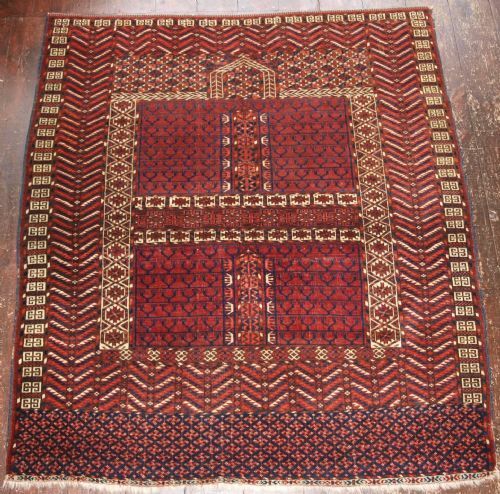 Antique Ersari Turkmen ensi of outstanding design with excellent colour. This example is woven with excellent detailed drawing; the colours are outstanding with a beautiful red ground and a very good light indigo blue. The ensi has superb soft wool and a very floppy handle. The ensi is in excellent condition with only slight even wear and good pile. Size: 5ft 0in x 3ft 8in (153 x 113cm). 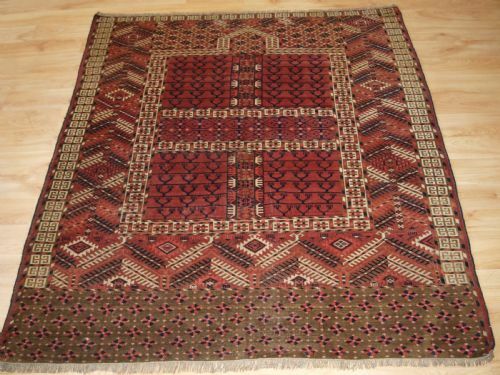 Antique Tekke Turkmen ensi of traditional design with excellent rich colour. 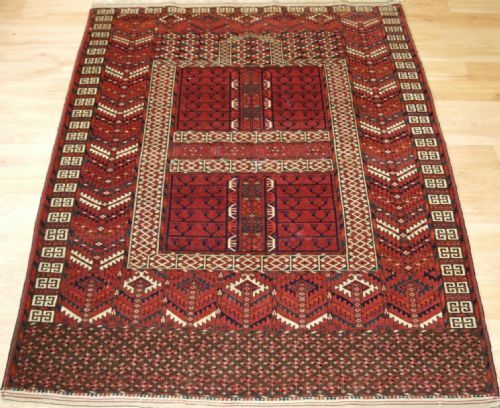 The rug is in excellent condition with only slight even wear and good pile. Size: 4ft 11in x 4ft 1in (149 x 124cm). 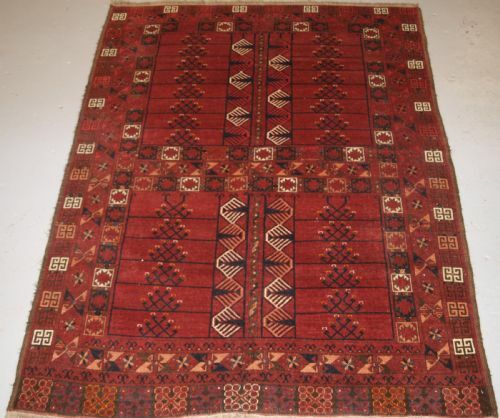 Antique Tekke Turkmen ensi of traditional design with excellent colour. 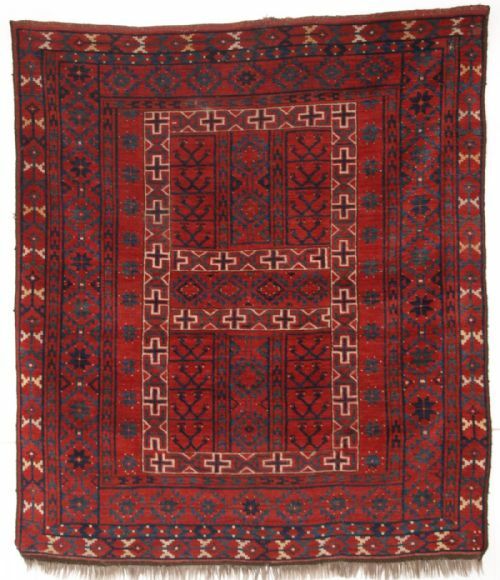 This example is finely woven with excellent detailed drawing; it retains the original kilim end finishes at both ends. Size: 5ft 4in x 4ft 1in (163 x 124cm). Antique Yomut Turkmen Ensi with double tree elem design. 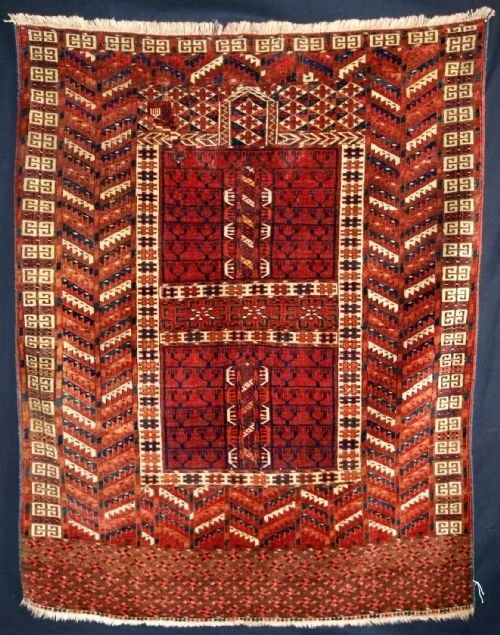 A very good Yomut Turkmen ensi (Yurt door hanging). This example has a superb red colour and two beautifully drawn elem (base) panels. The upper elem is of large stylised trees and the lower panel is trees on a vivid indigo blue ground. Good condition with even wear and medium pile, the ensi has fine weave and good wool. Size: 5ft 3in x 4ft 7in (160 x 137cm). 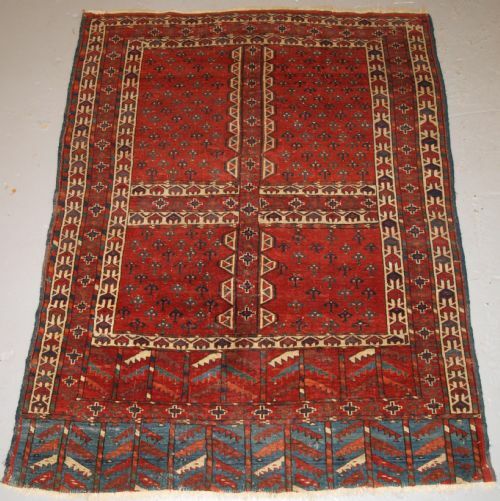 Antique Tekke Turkmen Ensi (Yurt door hanging) of classic Tekke design. 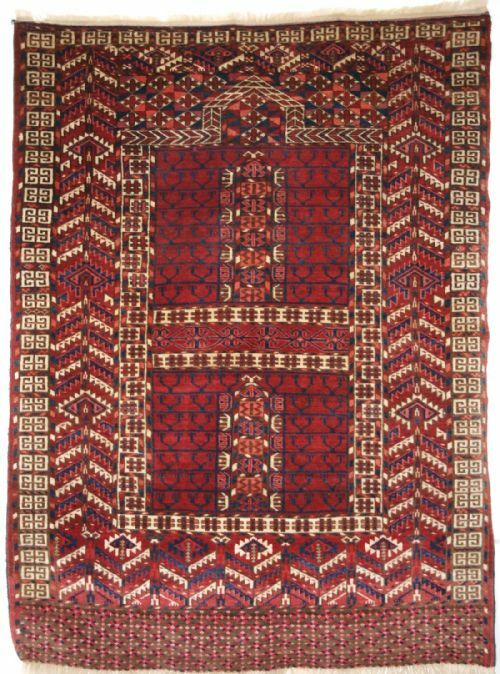 This is a pleasing example of this well-known type of rug; it is of firm weave and will make a durable rug for domestic use. The Ensi is well drawn with excellent colour. Size: 6ft 0in x 3ft 11in (182 x 122cm). Antique Yomut Turkmen Ensi with eagle and tree elem design. 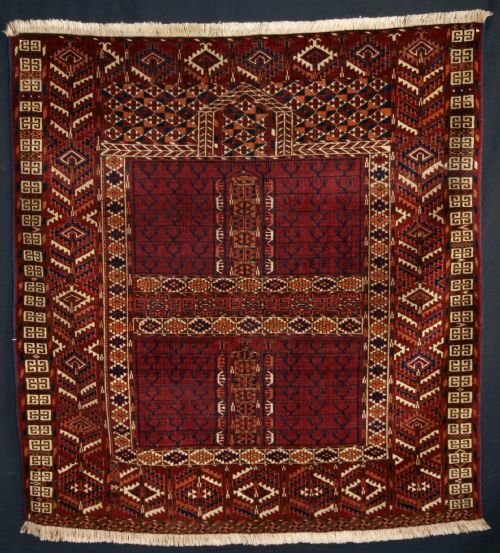 A very good Yomut Turkmen ensi (Yurt door hanging). This example has superb colour and two beautifully drawn elem (base) panels. The upper elem is of large stylised eagles and the lower panel is trees on a vivid indigo blue ground. Size: 4ft 11in x 3ft 10in (149 x 118cm). A good Yomut Turkmen ensi (Yurt door hanging). This example has rich colour and two beautifully drawn elem (base) panels. The upper elem is of large stylised eagles and the lower panel is trees on a dark indigo blue ground. The outer border and central column is of the curl leaf design. Size: 4ft 8in x 3ft 8in (143 x 112cm).